To me being a nasty woman means going out of your comfort zone and taking a risk to do what you are passionate about. For me, it was leaving my comfortable corporate job to take a huge risk and start Kali. But for someone else it could be as small as taking an exercise class that you are scared of. Forcing yourself out of your comfort zone. I think it's important for personal growth to step outside of our own boundaries. Coffee or tea? Definitely coffee and sometimes matcha. I always add a nut milk like almond. I try to stay away from dairy. Go to beauty products? Currently obsessed with Joanna Vargas everything and loving floss from Cocofloss. I floss daily. Always on the hunt for new natural products. What’s one thing that’s always in your handbag? I hate to day this, but honestly Kali. I have tampons on me all the time and I use our wake up oil constantly especially in the winter. Girl crush? Kate Hudson. She is a rockstar entrepreneur who seems very down-to-earth and kind. Go to outfit? Black, black, black. How do you incorporate women’s rights into your job? How do they influence your work? We believe that everyone has a right to know what is in their products. Currently, in the feminine hygiene space it isn't required for company to disclose what's in their products. We openly disclose what is in all of our products. Who is a woman you look up to and why? I recently had the pleasure of meeting and talking to to Joanna Vargas. She is very inspiring. She wanted to innovate and modernize her field. She has become a pioneer in the green beauty space and is focused on helping women. How did you come up with the idea of Kali Boxes? We wanted to help people rethink their period by switching to organic feminine care products and bringing self care into that time of the month. We love curating new, natural wellness products to share with our customers on a monthly basis. What is one thing you've learned from your customers? Great customer service goes a long way. We strive to listen to our customer needs. What are some items a customer might receive in their Kali box? Where should we start? So many things! You can customize your box with different period products such as liners, tampons, wipettes, and pads. If you choose the LUX box, you will get monthly curated wellness products such as Hum Nutrition samples, Cocofloss, Ursa Major facial products, Piper Wai, Little Seed Farm, Dr. Brite, and so much more. How do you balance running a business with your personal life? It's really hard at times. I make sure to make plans with friends and create accountability for my social life on a weekly basis. Do you have a crazy / favorite work story since starting Kali Boxes? I think it was pretty entertaining pitching our deck for our seed round to investors that were men. I would throw tampons on the table to get the conversation started and would watch them squirm. I think it's important to break the stigma of periods and make them easier to discuss for everyone. 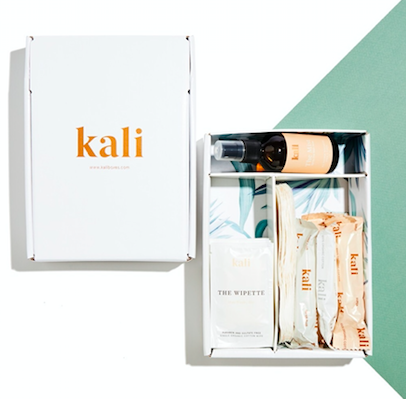 What is one thing you want your customers to know about Kali Boxes and your mission? We want customers to bring wellness full cycle with Kali. 76% of women are on a wellness journey yet only 15% of those women think of their period in that journey. We are on a mission to bridge that gap. Join us and rethink your period. What message/word would you wear on your RP custom jewelry? Why? Empower. I love this word because it represents the strength in all of us. It reminds me that we can do anything together. The life of an entrepreneur can be very stressful. In those moments I think of the quote, "Everything will be ok in the end. If it's not ok, it is not the end." It reminds me that things will work out the way they are mean to. Forcing an outcome never works out. General advice for anyone reading this? Sometimes life gets messy. There is no such thing as perfect. It's important to surround yourself around positive, supportive people that you love being around to balance out those messy moments. Also, remember to do something that makes you happy daily. It can be as small as sitting at a coffee shop enjoying a latte for 15 minutes.